A skull session with human evolutionary biologist Daniel Lieberman in the fossil room at the Peabody Museum. Millions of years of natural selection have shaped the human head. 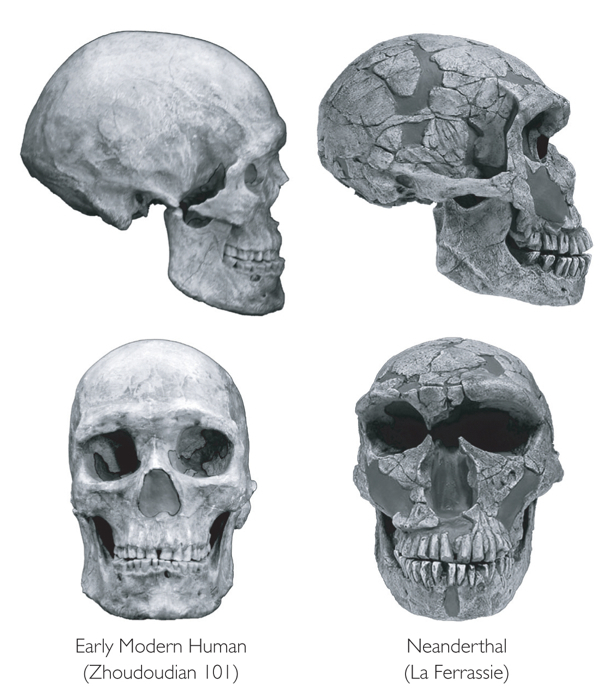 From left to right: a Neanderthal; Homo erectus; Homo habilis; Australopithecus africanus; Pan troglodytes (common chimpanzee); Homo sapiens (human). “Gonzo,” a Neanderthal skeleton, stands in the back. Top: An elite Kenyan athlete who grew up running barefoot strikes the ground with the forefoot when unshod, but with the midfoot when wearing shoes. 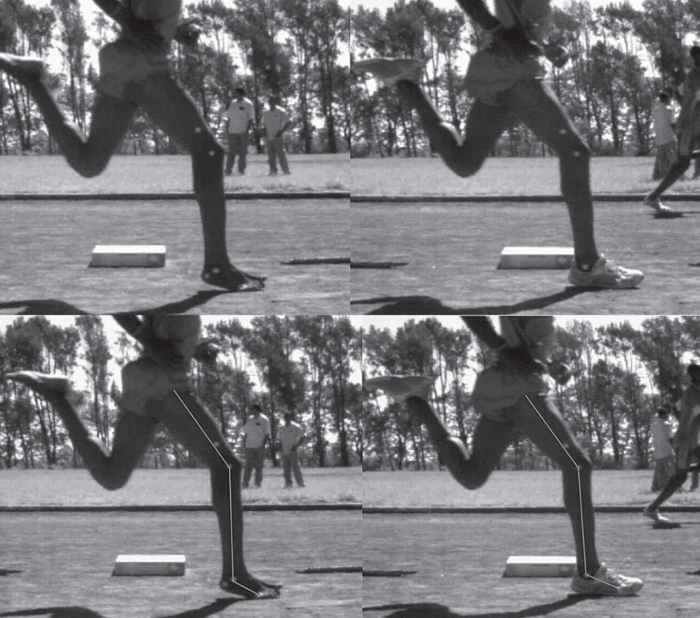 Bottom: The positioning of legs and feet is identical in both cases; the shoes alone affect how the runner’s foot strikes the ground. A comparison of barefoot runners shows that the magnitude and direction of impact in a forefoot strike originates under the ball of the foot, rather than under the heel, and involves much less force. 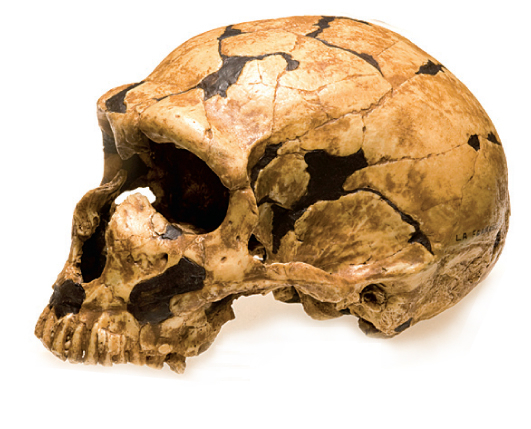 There are notable differences between skulls of humans and of Neanderthals. 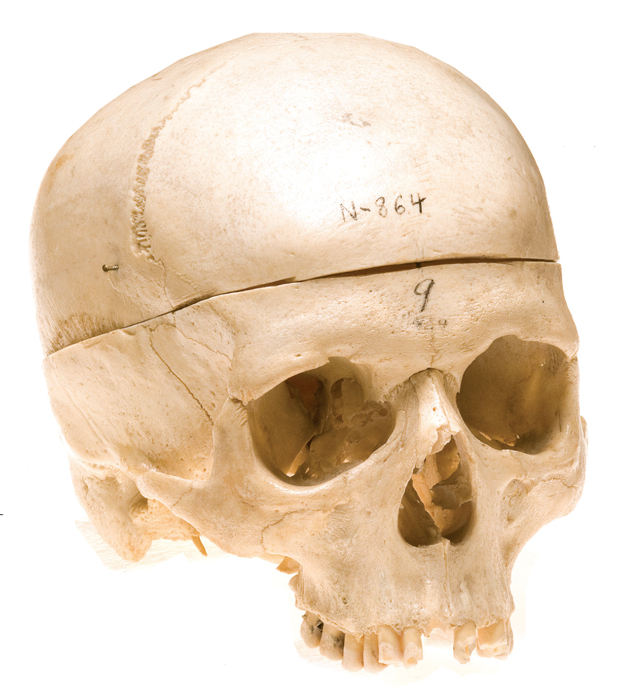 The human cranial vault is rounded, rather than lemon-shaped. Human faces are small and retracted and include chins. Neanderthals have large, protruding faces, with brow ridges and no chins. Differences of form lead to differences in function. Biomechanical analyses of inertial forces show that the three Homo specimens would have had a much easier time balancing the head while walking or running than would Australopithecus. 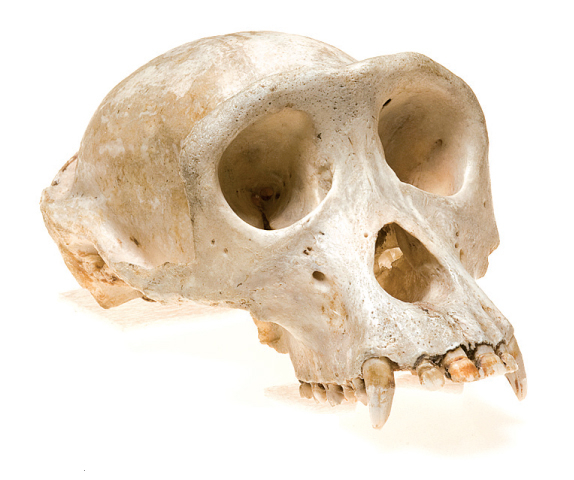 Front and side views of adult chimpanzee and human skulls highlight differences in patterns of facial growth. In both species, faces grow wider and taller, but chimp faces grow out and up to become more projecting, while the smaller human face remains tucked under the cranium. Beneath shelves of books on the biology of bone, a collection of skulls and running shoes lies in a jumble on a countertop. The skulls come in a range of sizes and shapes, from the tiny and sharp-toothed, with large orbits for the eyes, to the hefty and humanoid. The shoes are likewise varied, from brightly colored Nikes, to fluorescent ASICS, to slipper-like Vibram FiveFingers™ with separated toes—like a glove—intended to mimic barefoot running. 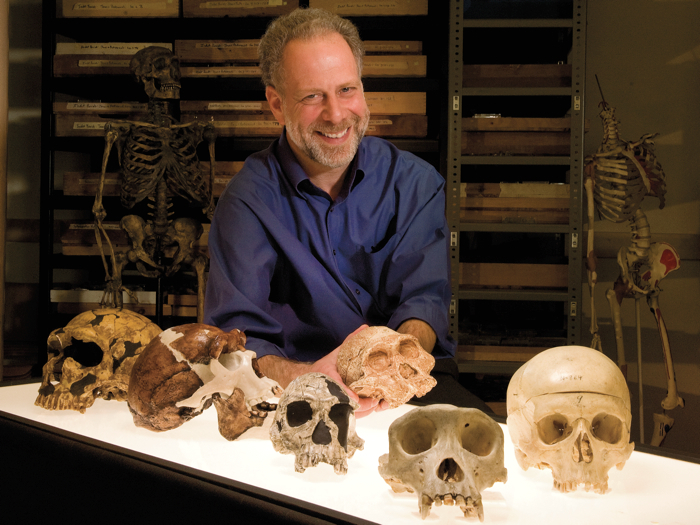 These collections neatly bracket the research interests of Daniel Lieberman, human evolutionary biologist: a head-to-toe interest in the human body, its morphology (the science of an organism’s form, including the study of specific structural features), its development, and its evolution. But the apparent dichotomy is bizarre only in the abstract, because Lieberman’s interest in feet—and human endurance running—began with his interest in heads. The two subjects are deeply linked. The theory that humans evolved to become endurance runners so talented that a team of barefoot hunters on a hot African savanna could actually run a large antelope to ground is based in part on skeletal evidence from the head—a subject about which Lieberman has just published a weighty book, 15 years in the making. “Many of the things we value most—our big brains, speech, much of our sensory biology—are in the head,” Lieberman explains. “It is the size of a soccer ball, and think what it does”: seeing, hearing, tasting, smelling, balancing, thinking, speaking, chewing, swallowing, breathing, and regulating body temperature. Lieberman’s book considers in detail how each of these functions works from a biomechanical perspective, and then theorizes how each evolved, simultaneously with the others, as part of an integrated whole. “The head presents an interesting evolutionary paradox,” explains Lieberman, chair of the new department of human evolutionary biology, “because on the one hand it is so complicated that if anything goes wrong, the organism dies. On the other hand, it is where natural selection can and has acted powerfully to make us what we are.” Everything is closely connected. For example, the roof of the orbits is the floor of the brain—if one changes, they both do. Though written so anyone can read it, The Evolution of the Human Head (Harvard University Press) “is not meant to be a bestseller,” he avers. Nevertheless, Lieberman takes up all sorts of interesting questions, such as why humans have big noses (there is a link to running), chins (nobody really knows), small faces that are tucked under the brain, and teeth that are suitable only for eating processed food. In short: Why does the head look the way it does? To probe such mysteries, Lieberman uses a variety of techniques. (The book draws on the expertise of many scholars as well as his own work.) 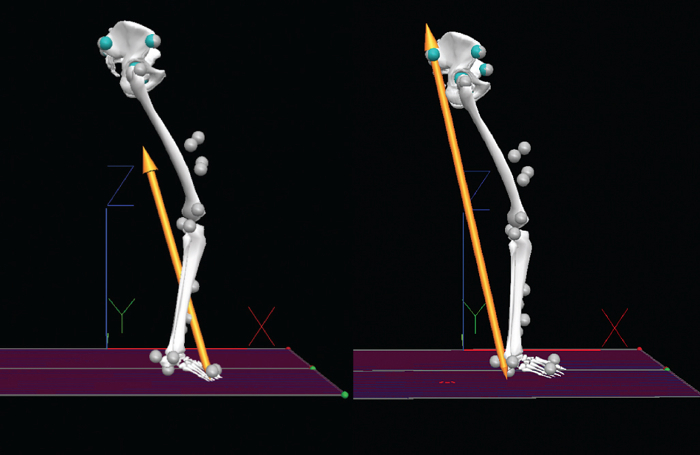 Experimental biomechanics is one. About nine years ago, while contemplating why human faces have become smaller in the brief span of recorded history—too short a time for evolution to explain—Lieberman wondered whether the modern diet of soft food might be a contributing factor. As bones grow, their size and shape respond to biomechanical stresses, so he decided to study the effects of chewing hard versus soft food on the growth and development of the skull in various animal species. In one experiment, he fed soft food to one group of pigs, hard food to another. The stresses of chewing made the upper and lower jaws of the pigs eating hard food grow larger. The study suggested that there is a link between smaller jaws and regularly chewing very high-quality soft food. And humans, he points out, have never had greater access to high-energy processed food than they do now. “I think many people today never have to actually chew anything all day long,” he says. “You can see the effects of that shift in our heads now in terms of molar impactions”—small faces and jaws leave too little room for teeth. Another recent biomechanical experiment, on the effects of shoes on skeletal growth, employed sheep. Putting shoes on sheep “sounds kind of crazy,” Lieberman admits, “but people wearing high heels change the angles of their joints. We wanted to see how that would affect how the joints develop,” so his team put plastic booties on the sheep and fitted them with balsawood lifts to simulate high heels. After a few months, the researchers were able to measure the growth rate of the shod sheep using computed axial tomography (CT) scans. “We will be able to extrapolate the effect of wearing shoes from that,” he says, though analysis of the data is not yet complete. Back in his office in the Peabody Museum, Lieberman uses comparative morphology and modeling to complement the biomechanical research. 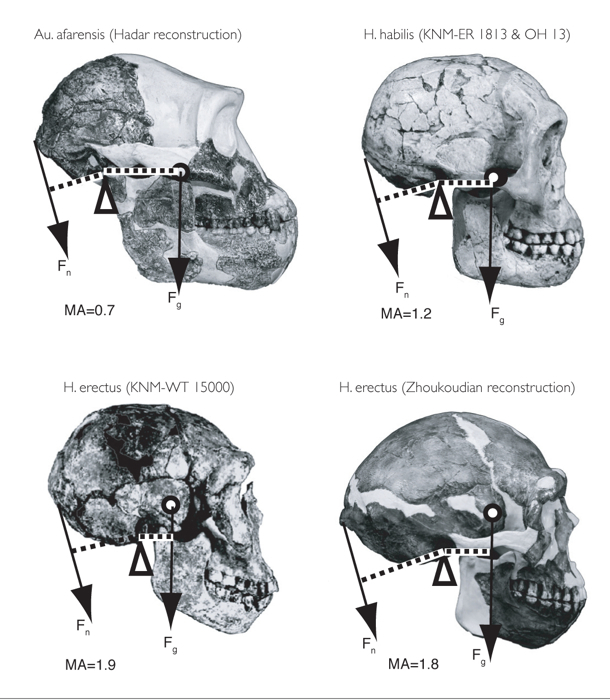 Computerized scans of skulls and other bones let him study their shapes in three dimensions, and easily compare the volume or size of a structure within an ape’s skull, for example, to that of a modern human (in which the temporal lobe is about 25 percent larger, relatively) in order to ask questions about human evolution. CT scans of fetal human skulls at progressively later stages of growth let him pose developmental questions focusing on trade-offs in the expansion of one part of the skull as opposed to another. Lieberman’s interest in running began with his research on the head in conjunction with Dennis Bramble from the University of Utah. Alone among apes, humans have a special ligament at the nape of the neck, attached at the back of the skull, that apparently helps the head to remain stable during running. Humans also have external noses combined with short inner nasal cavities that create turbulence in several ways during breathing, adaptations that may increase the ability to humidify incoming air, or dehumidify exhaled air, in arid climates. “We can also see in the fossil record when human heads develop larger organs of balance [the semicircular canals] that are better able to sense the rapid pitching motions caused by running,” Lieberman says. This was about two million years ago, when humans began eating meat. These changes in the ears, neck, and nose, along with more balanced heads, may all be features that allowed early human endurance hunters to chase prey until it collapsed from heat stroke. He explains the advantages of this holistic approach by using the evolution of speech as an example. “Close human relatives like Neanderthals probably had a vocal tract that was capable of fairly impressive speech, but probably not as articulate as ours,” he notes. “But you have to put probabilities around that inference, and you do that by thinking about the vocal tract not just in terms of speech, but also in terms of swallowing and respiration and development, and all the other things that a vocal tract must do in order for a person merely to live.” When writing the book, he employed this strategy to engage in a thought experiment, using models of all the life-supporting systems located in the head to limit or constrain the possibilities for the development of speech. 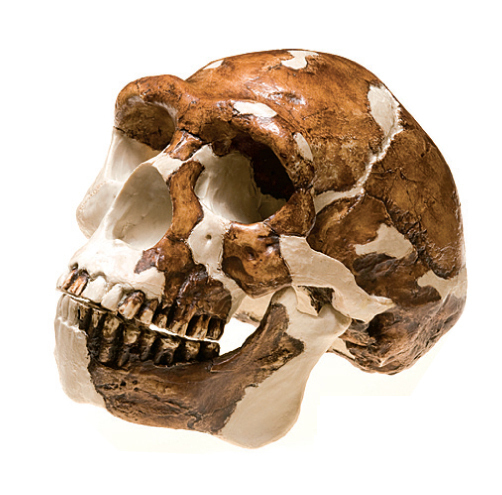 Such models allowed him to toy with the evolutionary possibilities—and create a hypothetical australopithecine head that meets all the necessary conditions. To power these extraordinary capacities, he continues, humans need reservoirs of stored energy for reproduction and endurance. Not surprisingly, therefore, we are a fat species. “Even the thin amongst us—a typical hunter-gatherer has 10 to 15 percent body fat—are fat compared to other primates.